Are Indian Index Funds worth investing in? Since Vanguard Group, led by John Bogle, launched the first Index Mutual Fund in 1975, Index funds have taken the investing world by a storm. Since Vanguard Group, led by John Bogle, launched the first Index Mutual Fund in 1975, Index funds have taken the investing world by a storm. Developed markets like US, Europe and Japan have seen an increased investor commitment to Index Funds. This trend was further accelerated by ETFs, since 1993, which made index investing easier and also added an additional tax advantage layer. Most active Mutual Funds aim to perform better than benchmark indices. Say, there is a Mutual Fund which benchmarks itself against the Nifty, its aim is to do equal to or better than the Nifty. This requires the fund manager to invest in research and pick the right mix of stocks which can do better than the Nifty. An Index mutual fund, on the other hand, replicates the Nifty exactly and therefore does not need to invest in active fund management. This incremental cost can be reduced from the overall fund management fee, thereby benefiting the investor. Typically Index Mutual Fund management fee is lower than Active Mutual Funds. Since Index Funds aim to replicate the underlying index (like S&P 500 in the US and say the Nifty or Sensex in India), the cost of managing these Mutual Funds is low, therefore saving on the management cost. This principle worked well in developed markets. This was because a large proportion of the markets consisted of institutional money and the institutional funds, at an aggregate, were struggling to perform better than the index due to the higher management cost layer. In India, though Index funds are yet to gain momentum. The last couple of years have seen a few large Index ETF emerge, primarily driven by some government divestments and EPFO investments – but this is still an early stage. 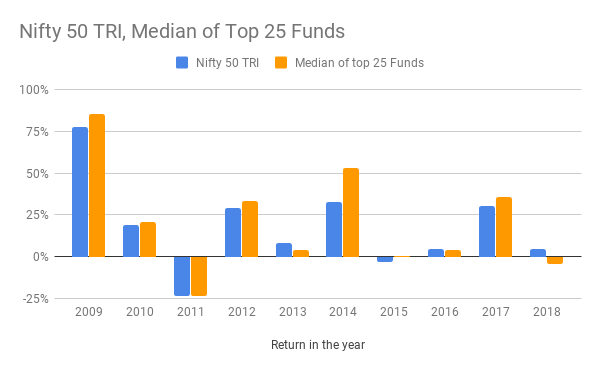 One of the primary reasons for this is due to the fact that active Mutual Funds, on the average, have been delivering returns which are better than the respective benchmarks. If one were to look at the Top 25 Equity Mutual Funds by size, at an aggregate, these funds have delivered 2.0 % pa return ahead of the Nifty over the past decade. This is after the management fees of these funds. This can partly be explained by the fact that Mutual Funds are relatively small, compared with the overall market and one can expect ‘professional fund managers’ to do better than retail investors. On the other hand, CY2018 seems to have been a landmark year where the active funds failed to deliver performance ahead of the Nifty. Only time will tell whether this is a one-off occurrence or if this trend is here to stay. Over the next decade, Index funds will gain prominence in India for sure, but given the track record, active funds are likely to deliver returns better than the Index for some time to come. Home › Finance Blog › Are Indian Index Funds worth investing in?